What: Kharasch-Sosnovsky Reaction: copper catalysed allylic oxidation using an organic peroxide. Why: many reagents react with alkenes to form dihydroxy derivatives. 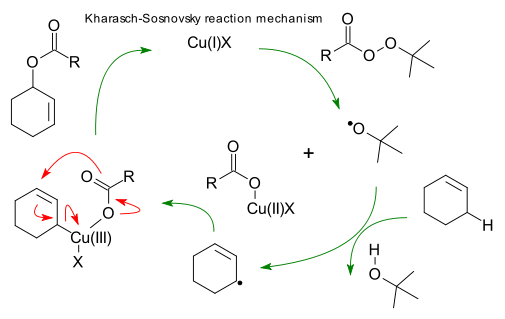 Free-radical based methods suffer from poor regioselectivity. One alternative method is selenium oxide based allylic oxidation. Asymmetric: An early chiral catalysis system (1965) is based on t-butyl hydroperoxide and a chiral tartaric acid (Denney et al. DOI).Two almost identical adapted methods were reported in 1995 and based on a bisoxazoline ligand (Gokhale et al. DOI , Andrus et al. DOI). The compound (S)-cyclohexenyl benzoate thus obtained is a key intermediate in leukotriene B4 total synthesis. Cu(I) cleavage of the perester to a Cu(II) species and t-butyloxy radical. Radical proton exchange between allylic position cyclohexene and tBuOH. Recombination of allyl radical with Copper acetate species forming a Cu(III) intermediate and finally pericyclic reductive elimination to product and regeneration of Cu(I). Deployment: Mukaiyama Taxol total synthesis step 44 to 45 is a variation.